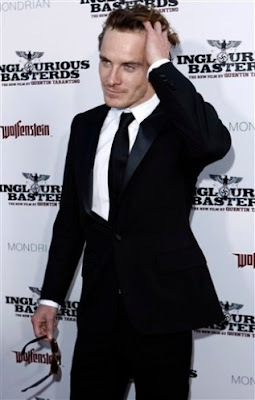 Fassinating Fassbender - A Michael Fassbender Fan Blog: POTW: Work it boy! There's no doubt he's a glorious red head. Why have people been hiding these pictures? The POTW is coming a day early (added two more for a treat). I won't be online at all Friday. And I'm not even going to lie, I have been so busy the past two days prepping for a hot job interview today with a cool Japanese company, so I was not able to update FNN this week as promised. So please understand and cross your fingers for me. 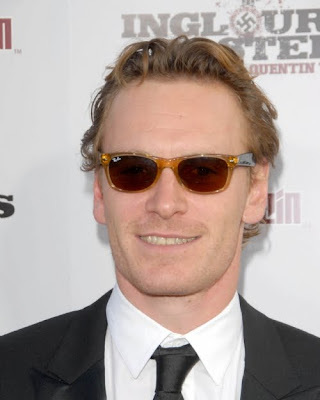 Anyhoo, the Fassy Gods tossed me some crumbs and I found this dated, but just added to cyberspace photo of Michael. He's playing with his hair, doing with it what we only dream of doing to it. Amongst other things we think of doing with/to him. And according to this EW.com article on Michael, when he's recognized, cool things happen: In the rare instance when he does get recognized, it's likely for his dapper — and quotable — British army lieutenant in Inglourious Basterds. Just how quotable? 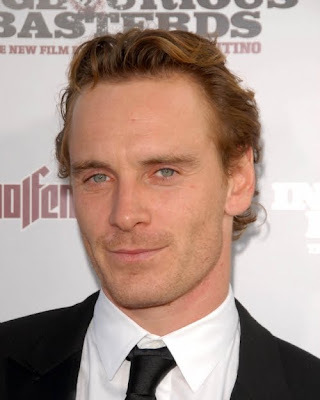 ''I was at a restaurant yesterday talking to the bartender,'' says Fassbender, who'll be seen as a henchman in this summer's Jonah Hex. ''He was like, 'Well, if this is it, old boy, you don't mind if I go out speaking the King's?' That was very cool.'' Just like the man himself.